This is our review of the best 2-slice toasters currently available in the UK market. If you are more interested in larger ones, then you can read our review on 4-slice toasters right here. On average you should expect to pay around £20 for a good brand toaster but the prices do vary from as low as £10 and all the way up to around £40. That price variation is down to the number of features you actually want to have on your product, the brand that you prefer and the material that the toaster is made from. You will pay more for stainless steel for example. Below I have done a Top 10 table of the highest rated 2-slice toasters currently available in the UK market. Underneath that, I have done reviews of the Top Five 2-slice toasters, which provide you with more information. *These are prices on Amazon.co.uk and may not always be current and accurate. These change frequently based on availability, special promotions, and more. Please be sure to double-check the actual price on Amazon.co.uk. Please also note that the ratings used are from Amazon and are based out of a maximum score of 5 stars. These can also change so make sure to check at the time of purchase. This one from Tefal has the highest rating according to actual buyers over at Amazon. It has maintained a rating of 4.6 out of 5 stars, and costs on average around £34 depending on where you make your actual purchase. There is also a kettle to match this one, should you decide this is the one for you, and you like your kitchen appliances to match. This one is only available in the brushed stainless steel so there are no colour options. It uses 850 watts of power so this one toasts fast. It has a bun warmer for things like croissants or Danish pastries and also has a removable crumb tray. The slots are wide and buyers rate this toaster very highly. For best prices and any available discounts please click here. This one is about half the price of the first one and also has a very high rating of 4.5 out of 5 stars. Costing around £23, I think this one is particularly great value for money. This one has all the features that a toaster should have, and is keenly priced. It has a variable browning feature (7 in total), high life, crumb tray and also cancel, reheat and defrost functions. When you combine those with wide slots and an anti-jam feature then you do have a nice quality product. The Andrew James brand is now a popular choice for many and we think the price of just £19 for this 2-slice toaster is the best value currently available. Given the fact that is also has a 4.4 out of 5 star rating, this one should be given some serious consideration. This one uses 800 watts of power, has both defrost and reheat functions, along with a cancel function and you have the option to vary the temperature control. It also has a crumb tray and a place to store away the cord. This one is we think both very stylish and very functional. Warming racks are becoming every more prominent on toasters, and they certainly do make a nice additive we believe. Almost all of the more modern 2-slice toasters will come with this option. Likewise the Vonshef brand is also growing in popularity. In many cases people will buy a toaster based on the fact that it works well, and then on appearance and what will match into their kitchen décor. This one has maintained a high rating of 4.4 out of 5 stars, and again we think this one is good value at an average price of £21. This one does have the highest wattage on the list but please note, this model is only available in the black finish, which may not be for everyone. It does however have quite a complete range of functions with reheat, defrost and cancel. This one also has extra wide slots suitable for bagels etc. It also has the “cool touch” feature which keeps the sides of the toaster cool should you inadvertently touch them, and many people like to have that available. Click Here To Read Other Reviews and Find the Best Prices. And at number five on our list comes this toaster from Bosch. This one also has a good rating of 4.3 out of 5 stars, and costs on average around £22. This one is available in three colours which are cream, red or black. It has wide slots which means it will be able to handle different sizes and thicknesses of bread. There are both a reheat and a defrost function, ideal for making toast if you are taking bread straight from the freezer. As you can see from the image, this one is a very traditional design and will suit many types of kitchen design. Bosch also do a range of kettles that are designed to match the toasters available. So if you are someone who likes everything to match up, then this range is well worth a look. Bosch are of course well known for producing very good quality products that last. Like most German designed products, this one is simple, basic, looks well and works. Now it does not have a lot of bells and whistles. apart from the bun warmer, but it works really well. 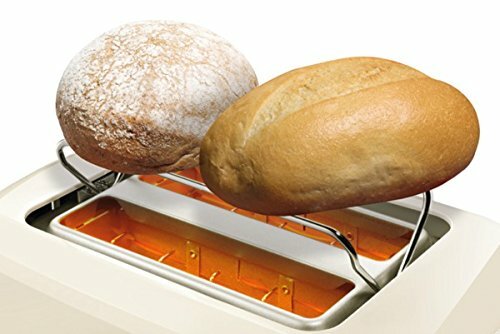 You may want to toast different breads such as sliced, pan, bagels, muffins etc so make sure your toaster has wide enough slots. Almost all toasters come with these basic functions, so just make sure the one you buy has these, as they are very useful. When you toast on a regular basis, it is inevitable that bread crumbs will fall through the toaster slots. A tray at the bottom, which can be removed, emptied and cleaned makes keeping your toaster clean a quick and simple thing to do. Not all 2-slice toasters will have this function. It keeps the side of the toaster cool and helps prevent accidental burns of the fingers and hands. Many people like to have this function especially if they have small children. These are a recent and interesting addition to most modern toasters. They sit on top of the toaster, and can gently heat up pastries, croissants etc. It is a nice little function to have. So folks, there you have it, the Top 10 rated 2-slice toasters currently available in the UK. We hope that you found the information useful.